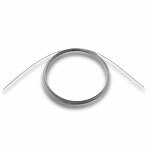 The KLUS PDS4-O round shaped channel comes in a double anodized aluminum finish and can be used to make a variety of custom light fixtures using our low voltage LED strip lights and extrusion mounting accessories. 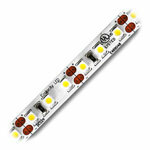 Choose from a variety of different cover and end cap options to protect your LED strips. Our extra frosted cover can produce a desirable line of light with no hot spots using a strip light with at least 3 LEDs per inch. 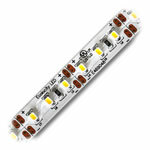 Using end caps with conductive posts you can power your LED strip to create custom hanging or offset lighting fixtures. With the focus lens you can decrease the beam angle to 10° for a more condensed beam of light. 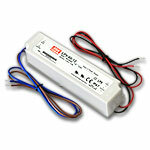 This channel is also available in 3M lengths, please call (775) 636-6060 to order. 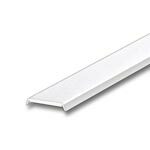 A set of 2 clips for mounting a variety of our KL1 type LED Aluminum Channels with 0.44" mounting base. 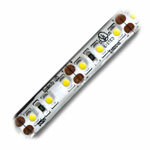 Works with a number of our aluminum channels for mounting to any drillable surface. 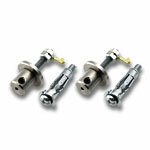 Comes with 2 clips for a secure mounting solution that is simple to install. 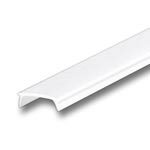 See a list of compatible extrusions that can be used with these mounting clips below. 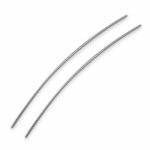 A minimum of two clips per 1M channel are recommended for a secure installation. 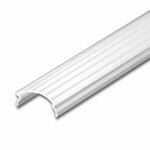 We have white plastic end caps for our .5" deep round shaped PDS-O LED Aluminum Extrusions to give your extrusion a clean and finished look. 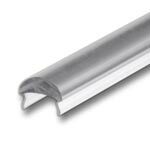 This cap will fit both the clear and frosted diffuser styles. This product is sold individually and in single units in order to pair with holed end caps if needed. With proper sealing technique and use of an HS outdoor cover these caps can achieve an IP67 water-resistant rating and can be used in outdoor environments. 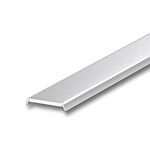 This product is a plastic end cap for our .5" deep round shaped LED Aluminum Extrusions to give your extrusion a clean and finished look while allowing wires to pass through the end cap. This cap will fit both the clear and frosted diffuser styles. This product is sold individually and in single units in order to pair with closed end caps if needed. This product is non water-resistant and not meant to be exposed to outdoor elements. 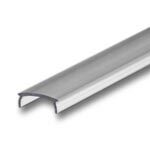 This product is a plastic end cap for our .5" deep round shaped LED Aluminum Extrusions with a built in electrical conducting pole in order to create custom lamps and hanging fixtures with a clean and finished look. Simply solder your positive connection to one end and your negative connection to the other. 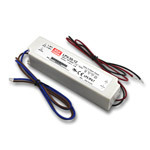 This cap will fit both the clear and frosted diffuser styles. This product is sold individually and in single units in order to pair with other end caps if needed. 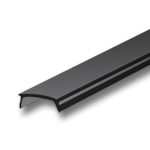 With proper sealing technique and use of an HS outdoor cover these caps can achieve an IP67 water-resistant rating and can be used in outdoor environments.